The Carrboro Citizen has another report on Carrboro’s BOA’s decision not to amend the inter-local agreement governing access to Lake Jordan water. Board member Joal Hall Broun said the issue was not the lake water, but freeing up OWASA in the event of emergencies and allowing the utility to find ways to keep the cost of water from rising. Many people in the community can’t afford increases in their water bills like those seen in recent years, she said. Joal should recall that OWASA bills went up as this community met the conservation challenge. It was not the lack of water that increased fees but the unsustainable cost structure of OWASA and the way capital outlays are financed. It boggles the mind that five years into our great conservation efforts local leadership still hasn’t pushed OWASA to rework its financial model to reward good behavior. Our neighbors across the tracks are celebrating their 100th birthday today. Carrboro, “the little community that could”, has still managed to keep itself, as local radio icon Ron Stutts likes to say, “one degree cooler than Chapel Hill”. Celebrations start this evening around 7:30pm at the Century Center across from Weaver St. Market. In case there’s any confusion, Morgan Freeman had nothing to do with this post! I’ll be helping the Orange County Democratic Party over at the Caldwell precinct in northern Orange County from 9:30am to 4:00pm. Drop by if you’re in the area. I know, Elaine isn’t running for the bench but since I have your attention…. A lot has been made of the apparent Democratic electorate malaise this year. We are still involved in the longest war of our country’s history. We still haven’t punished the use of torture or kidnapping as tools of war. Affronts to our Constitution, to basic human rights continue to be promulgated. Backroom deals derail chances of improving our populaces health and welfare. Billions are bilked and the public coffers milked. Spying and lying are now commonplace insults to our country’s democratic well-being. So much of the same old, same old with nary a peep from so many Democratic “yes we can change” Congress folks. I understand that immense lethargic unease the folks that turned out in 2008 must feel. Does that mean we need to suffer with a Burr under our saddles another 4 years? Hell no. Elaine is more than the anti-Burr choice. She wasn’t supported by the torpor inducing national Democratic apparatchik, a real win in my book. She will work to bring real change on behalf of all North Carolinians if elected. Do your part today to make that happen. Both candidates have a strong record on governmental transparency, solid experience and track records of reasonable judicial advocacy. While Jackson served as counsel under Labor Secretary Cherrie Berry during a period of time when that office was less than proactive on a slate of labor related issues, it’s not clear to me if her role allowed her to advocate for better outcomes. Hunter has the edge in experience, great endorsements and, as a Democrat, the background to work towards an equitable decision on Congressional redistricting should it land in the Court’s hands. Court of Appeals – Gray,Elmore,Geer. Gray and Geer, Democrats, have solid reputations, been unequivocal that politics will play no role in their courts. Elmore is a solid choice. Court of Appeals – Instant Runoff version: Thigpen – 1st. Hammer – 2nd. Payne or Middleton or Vesper -3rd. Board of Commissioners – Earl McKee. I’ve been watching Earl as he has taken on a few County issues these last 18 months. He spent 6 months attending BOCC meetings to get a feel of the office before ever standing up and speaking his piece. His first issue, challenging the expensive remodeling of an office space to serve as a Commissioners chamber, demonstrated the type of leadership he plans to bring to the Commission: he did his research, spoke sincerely and directly to the issue, stood firm on his principles while pursuing the best policy for both his rural district (District 2) and the County as a whole. This is a lousy year to raise any taxes – no matter how small the bite – but that is not the main reason I stand so firmly opposed to this referendum. Poverty is on a steep uptick in Orange County. Demand for health and welfare services is at an all time high. Long needed structural shifts – from fully staffing our community health system to shifting the emergency homeless shelter burden off the IFC – are not occurring supposedly due to fiscal difficulties at the County level. Yet, when presented with $2.3M from a sales tax or $4.6M windfall from refinancing the County’s debt, the BOCC chose areas outside those vital needs. I lobbied them to put the lions share towards addressing the needs of those struggling the most – for the 1 in 5 Orange County residents in poverty and other residents who are just treading water. $2+ M new revenue targeted effectively represents more than a life jacket – it would lift folks out of the deep end of the pool and move them on to firm ground. Again, I appreciate the BOCC making a somewhat firm commitment to spending priorities – I just don’t support the same set of priorities. The BOCC has been clear, as they should be, that this revenue sharing plan is a firm commitment over the next 5 years and will not change – period. The BOCC has also reaffirmed their stance that this new revenue will not replace existing revenue or cover existing expenses – it is new money for a new purpose )funds will not be freed up elsewhere that could be redirected to human services). Given that, tomorrow, I’m voting NO for the sales tax in hopes that we will get another chance to set the priorities for that spending, that the new priority will be waited heavily towards addressing human service needs and that core needs – like improved emergency medical services(EMS) and required school facility repairs – be paid out of core budget. The Triangle is a great place to live for many reasons, one of which is the incredible folks you meet from all walks of life who are working to make the world a bit better. Carrboro’s Joan Widdifield is working to improve Bolin Creek’s health. A regional resource, Bolin Creek, its associated watersheds and subsequent water courses needs some real care and attention. Dr. Joan is also a consultant advising Clear Path International, an organization dedicated to dealing with the ongoing trauma of unexploded ordinance (UXO) around the world, on mental health and PTSD issues. As part of that effort, she is working on “Hearts and Mines”, a documentary shedding light on the problems UXO continues to cause in Vietnam. Hearts & Mines is the story of the epilogue of the Vietnam-American War. More than three decades after the peace has been declared, Central Vietnamese villagers still live with the specter of unexploded ordnance (UXO) that can strike at any moment. With unprecedented access, this dramatic documentary follows victim-assistance and mine clearance NGOs and shines a light on the far-reaching effects of military conflict and the power of unexpected kindness and encouragement. Elaine and Lee are my next door neighbors. I’m usually hesitant to participate in these corporate campaigns but….the need is there and Elaine and Lee are working hard to address the growing demand for recreational opportunities for special needs folks in this community. That was enough to get me beyond my initial trepidation. Please consider participating in their call to action and help fund recreational programming for special needs individuals in our community. Lee and I have spearheaded an effort to develop social and recreational programming for special needs individuals in our community through our local Jewish Federation and Jewish Community Center. We have applied for a grant for $25,000 from the Pepsi Refresh Challenge. We have one month to get as many votes as possible in order to be one of 10 winners in our category. Like American Idol, we need to spread the word and have people vote daily. Below is information about the project and how to vote. You can vote once a day between now and August 31. We are currently in 87th place, having climbed from 348th in 3 days, so we know that mass voting makes a difference. BRIDGES is a local, non-profit, recreational program that helps people with special needs have fun and learn new skills. If you and all your friends vote for our proposal, BRIDGES can win a $25 thousand grant from the Pepsi Refresh Project. www.refresheverything.com/bridgesdch (click) on the web. Click on Vote for This Idea. Remind your friends to vote daily. You can vote once a day every day from August 1 to August 31 2010. Learn about BRIDGES: www.shalomdch.org, click on the BRIDGES logo. If you don’t want to use a “real” email address, take a look at Mailinator. It’s an online service that provides “disposable” email addresses to avoid spam. WUNC’s Laura Leslie (a reporting treasure) has a great post (Mon. : Stop me if you’ve heard this one before) on tonight’s 47 to 1 NC Senate vote “to ban video gambling – again – in North Carolina”. Republican Tom Apodaca didn’t mince words in urging his fellow senators to ban video gambling. It’s not the first time Apodaca’s said that. North Carolina has been trying for years to get rid of video gambling. Its critics say it’s addictive, it breeds crime and corruption, and it preys on low-income and minority populations. And yet, it’s more popular than ever among those who say it’s harmless entertainment. Wilmington’s Democratic Sen. Julia Boseman was the lone dissenter, arguing that the industry, if properly regulated, could generate millions of dollars in tax revenues. You might recall a similar argument made in selling NC’s “educational” lottery. If the lottery is any indication of the trajectory Internet/video gambling would take, the only way to grow revenues is to expand the reach of the games. With the lottery, what started as sales of tickets for a NC-only game became sales of scratch-offs along with mega-lottery options. Easily deployed, requiring no special infrastructure, regulating the games the Senate banned this evening would become exponentially more difficult as their numbers increased. …critics warned that video poker had become a front for organized crime. The allegation turned out to be true. Operators were bribing local officials to look the other way, and pumping money into campaign coffers to make friends in Raleigh. Federal investigators sent about half a dozen people to prison – sheriffs, industry figures, and eventually, former House Speaker Jim Black. I was and remain firmly against NC’s “education” lottery. Like many state lotteries, the promise has far exceeded the benefits while the damage has been more widespread than supporters claimed. Studies show that lottery per capita revenues tend to come from the poorest parts of the State. It appears folks having difficulty controlling their scratch-off ticket purchases – whose attraction is pernicious – aren’t getting assistance from the service setup to handle that contingency. And, as feared, some school districts have come to imprudently rely on lottery monies for core needs. Given those problems it makes little sense, moral or otherwise, for the State to be in the gambling business. So, while I welcome tonight’s ban on video gambling, I’ve got to wonder why the Senate doesn’t apply the same concern to NC’s lottery shakedown. Brother, can you spare a quarter percent? The Orange County Board of Commissioners (BOCC) opened up discussion this evening of putting a %0.25 increase in local sales tax before voters in November (Levy of a One-Quarter Cent (1/4¢) County Sales and Use Tax [PDF]). The tax, if approved, will bump our local sales tax to %8 with all the additional proceeds going directly to the county (it seems like it was mentioned several hundred times that the municipalities would get NADA from the increase). Best estimates, and only if a pending state bill is passed, has the county reaping in $500K in 2011 rising to $2.4M in 2012. I spoke before the BOCC on the issue – raising a few concerns, suggesting a possible course of action. I acknowledged the Commishes quandary in filling the current $9.4M hole in the County’s budget and the near certainty of dealing with an even deeper one in 2011. I recognized the appeal in making a seemingly small increase in a tax that is spread across a wider arc than property taxpayers. I understood it probably seemed an easier sell especially given the recent turmoil over our hefty property revaluations and the failed attempt to create a land transfer tax. I also pointed out even though it doesn’t apply to food or medicines that the increase represented an additional burden on those folks living here who can least afford it (the characterization in the press that “what the heck, it’s only a few more bucks week!” really bothers me). By its nature, it is a regressive tax. Given that increased burden, I asked the BOCC to commit in as legally a binding way as possible, to dedicating the new revenue to funding the rapidly growing demand on social services. That revenue should bolster the existing commitment and go well beyond this year’s baseline (not to rely on it, as many counties have with the NC lottery and education). Steve Yuhaz and a few other commissioners suggested throwing this modest amount of money – $2.5M at best – at the schools or pouring it down the current economic development rat-hole. Spending $2.5M on needed social services would have a much more profound effect than adding to the considerable school system overhead or to funding economic incentives during this downturn. And it’s the right thing to do given the rather dire outlook for next year. that the public be given plenty of opportunity to weigh in. At the conclusion of the topic it was clear that public input beforehand will have to come quick – June 15th to be exact. Several counties, like New Hanover, were used as success stories for the referendum. New Hanover, of course, has much lower property taxes and with its tourist draws has much greater outside revenue flows. Orange County’s increase will be borne mostly by Orange County residents. Comments by several commissioners that this broad 1/4 percent sales tax would bring revenues in from residents not currently “paying their fair share” made very little sense given that a pretty good chunk of the existing %7.75 sales tax paid by all residents ends up in the county coffers. It was also strange how quickly the discussion settled on two options – raise sales taxes or property taxes. The obvious third option – raise no taxes – didn’t make it onto the table. My suggestion to time limit the measure didn’t get traction. Long time NC residents probably recall that a fair portion of the existing %7.75 sales tax was supposed to be “temporary”. Like many of the current “usage fees” and other tax burdens, government claims on our income tend to take on a life of their own and rarely get rolled-back (at least on middle and lower income folks). The rates might get adjusted but the real outlays stay the same or increase. It’s hard to dodge the appearance that raising the sales tax rate has more to do with an inability to prioritize spending than fiscal discipline when the increase has an open-ended expiration date. Sales tax revenue is sensitive to prevailing economic conditions. Without a dramatic upturn in the economy or a steep expansion in the County’s commercial tax base – both unlikely in the near future – the dependability of this revenue stream is not sufficient to fund core services. Finally, the oddest arguments of the evening circulated around the reason for raising and the commitment to restrict the expenditure of the funds. Many commissioners argued (and then voted for) a course of action that essentially boiled down to this: put the referendum on the ballot with little public discussion and then invite the community to speculate on what the funds are to be used for and how firm the obligation to spend them accordingly will be. I pushed for public participation first, a clear statement on the use of the new revenues (I lobbied for human services first, debt reduction – as County Manager Clifton pointed out – a good second) and a legally binding obligation to use the funds for that specified reason. That way the community would have a clear idea early on as to what they would be asked to vote into being. Feels like, at least at this point (with June 15th weeks away), public participation is an afterthought. Been awhile, November 2006, since I scrambled around trying to cover all the precincts in Carrboro/Chapel Hill. Visited all 29 precincts, placed 45 new signs for Sheriff Candidate Clarence Birkhead, repositioned another 40+ so that most folks will have to pass at least 3 signs before voting. Started about 5pm in a light drizzle punctuated with a few down burst, ended around 9:30pm under beautiful clearing skies. Most years the precincts are ready to roll late afternoon but this year I found visible signs of preparation only at Aldersgate, Friday Center and Scroggs. Most confusing moment? Carrboro High School. Haven’t been there during an election so I was a bit at a loss figuring out where to put signs (what a industrial size behemoth!). I’ll be staffing the Library poll early and late, Community Center round noon and floating around between Binkley and ?? mid-afternoon. Drop by and get a Clarence button if you get a chance. Went to this afternoon’s Council committee meeting to see how Orange County’s Commissioners would respond to Chapel Hill’s demands to increase Library operational funding NOW rather than later. A few general observations/comments before my notes. First, an apology to my loyal readers. I have spent much more time accumulating content than presenting it. For instance, I went on the recent Town sponsored walk through Northside, led by Empowerment’s Delores Bailey (whose mother lived along the route), to review various NCD (neighborhood conservation district) violations and missteps (which generated these Council concerns the following Monday). Took lots of pictures, made lots of notes, hope to turn it into a post “sometime soon”. Given the huge backlog of content, I’ll try to pick up the pace over the next month. As far as the Library funding issue, it’s clear that Chapel Hill has been subsidizing access to the %41 of County residents who hold library cards for too long. The portion of that expense, calculated simplistically as a straight ratio, totes up to almost $7 million over the last decade. Given that there is a huge gap between the level of service our community has demanded and paid for those last 10 years – at a yearly cost now of $3 million dollars – and the level of service offered county residents – funded to the tune of $1 million – one could argue – as Orange County’s Manager Frank Clifton did – that the putative subsidy’s scope is distorted by Chapel Hill’s historical level of extraordinary support. While I agree with Council member Gene Pease, that the whole of the county deserves to have a library system more akin to that of Chapel Hill’s, I also agree with Frank’s analysis – comparing Chapel Hill’s caviar diet to the more modest appetite of County residents is an apples to oranges comparison. As I’ve noted before (Library or Lot #5? ), even though Chapel Hill has been unfairly subsidizing service for years, the demand for more operational funds NOW is being driven by the majority of this Council’s stated desire to imprudently issue $20.1M worth of bonds in June rather than addressing a fundamentally inequitable situation. Given that the Council will not shed the ridiculous Lot #5/West 140 financial liability in order to deal more effectively with the fiscal strain a Library expansion will place on the budget, their demand to the Board of Commissioners, especially given the deep hole ($6M+) Orange County finds itself in, rings hollow. Why the emphasis on increasing operational funds then? To make the case for doing the expansion now irrespective of foreseeable economic conditions arguing otherwise. According to today’s Chapel Hill News (IFC may delay new shelter), the Inter-Faith Council is looking at a delay while the questions raised by local residents over the last few weeks are resolved. Inter-Faith Council director Chris Moran said the agency may delay its development permit application amid neighbors’ opposition to a new men’s homeless shelter on Martin Luther King Jr. Boulevard at Homestead Road. Despite support from United Church of Chapel Hill, which is adjacent to the site, Moran faced a throng of red-clad protesters as the Town Council reviewed IFC’s concept plan for a 50-bed shelter last week. These neighbors anticipated homeless men loitering, panhandling or causing other mischief around their homes, schools and Homestead Park — basically, the same complaint some downtown merchants and visitors have expressed about the street people downtown. The council challenged IFC to address these concerns and explain how the agency chose the Homestead site. For example, IFC is seeking detailed crime data from the police department for its Rosemary Street shelter. That sort of research could disrupt IFC’s initial plan to gain a permit about a year from now and open the doors in January 2012. I asked Police Chief Curran a couple weeks ago for some of the required statistics (here). I’ve read every email forwarded to the candidates on this issue with an eye towards publishing those questions for inspection by the wider community. Luckily, Tina Coyne-Smith, one of the concerned citizens that has taken a lead on this issue, prepared a detailed assessment of the neighborhoods’ issues for her presentation to Council last week. She has also graciously provided a copy (here [PDF]) so that the public, the IFC and other stakeholders can review and respond in a fact-based manner. A few of the underlying issues raised have been answered by Chris Moran in the FAQ he provided earlier here (Q&A IFC Community House). I also recently asked the Town’s Attorney Ralph Karpinos if the IFC, in cooperation with the police, could rule out who on the list of incidents was not a shelter resident. Anecdotal evidence indicates that folks report their address as the shelter even when they aren’t clients. He responded that this was a question for the IFC. While I believe there is value in sharpening up the statistics, I also want to protect the privacy of those that IFC serves. Any method the Town uses to get a better grasp of the scope of this potential problem must honor folks right to privacy. Whatever the outcome of the current discussion, the process used must be transparent, fact-based and use a decision-making framework that incorporates the requirements of the IFC, community-based criteria (as with the waste transfer site selection), the Town’s legal and developmental guidelines along with a strong dose of common sense. Given the respectful tone established by Tina, Chris and many of the other folks that spoke last Monday, I believe that our community can not only reach a consensus on this particular issue without bitterness but also take this opportunity to work even harder on addressing the problems driving and accompanying homelessness in our local community. There are a lot of questions about the IFC’s plans to site the new men’s homeless shelter on Homestead Road. As a candidate for Town Council, I have been reading concerned citizens emails and letters – almost 100 or so – on this project. Executive Chris Moran has prepared the following Q & A based on a number of questions the nearby neighborhoods raised. I’ve converted the first section of the document to HTML and will work to finish that conversion soon. Until then, here is the complete response as a PDF. It is our understanding that the Town is involved with the development of the IFC Community House project. We know that the community Design Commission met about this issue on June 17, 2009 and that the Town council is scheduled to meet about this matter on September 21, 2009. We also know that there is a file about this project at the Town’s Planning Department. The full extent of the Town’s involvement, however, remains unclear. What has been the formal planning and development process for the IFC Community House project relocation? The Inter-Faith Council for Social Service (IFC) developed a formal partnership with the Town of Chapel Hill in 1985 when the Town Council offered the IFC a no-cost lease in the Old Municipal Building (OMB) to house homeless persons. The program began in congregations, then moved into the basement of the OMB and eventually expanded to the entire OMB after Council members approved a task force recommendation that the OMB be used as a homeless facility. The IFC formed another partnership with the Orange County Board of Commissioners in 1994 to plan and develop a new facility for homeless women and children initially called Project Homestart. The Board of Commissioners provided a no-cost 25-year three acre parcel on Homestead Road to the IFC at the Southern Human Services Center. Since HomeStart’s opening there has been no adverse or negative impact on neighboring areas. In fact, new neighborhoods have developed near and around our HomeStart campus. The Church of the Advocate will soon be building a new church in our vicinity. And the IFC relocated single women guests from the downtown Community House facility to HomeStart during the same year. There have been myriad community meetings and task forces appointed by Chapel Hill mayors since the year 2000 to find a permanent location for Community House. A formal agreement and special task force was created by Mayor Kevin Foy and IFC’s Board President in 2004 “to address homelessness and new facilities”. The Board of Directors came to three major conclusions based on task force recommendations during this process. When will a final determination (i.e., approval or disapproval) be made on this project? The IFC will be applying for a special use permit (SUP) for the Community House project sometime this fall. Final Town approval is expected in the spring or summer of 2010. Timing is dependent on the Town’s planning process. Carolina North: Where is the Development Agreement? As some of you folks know I’ve been involved – as a citizen – fairly deeply in the attempt to create a successful agreement between UNC and the Town managing growth of the massive Carolina North project. The Carolina North project could either contribute greatly to or severely diminish the quality of life in Chapel Hill. To succeed we need a comprehensive agreement that we all can live with. It needs to be fair, not shifting significant costs onto local residents. It needs to manage impacts so that water, air, noise and traffic concerns don’t spill over into the wider community. It needs to meet the needs of the University while honoring the community in which it thrives. It also has to have understandable consequences, demarcated trade-offs and a compliance regimen that UNC will follow. I’ve attended almost every forum, meeting and public hearing. Suggested improvements in both process and content, more than a few which have been incorporated into the CURRENT draft. When Council started the final phase of the process, the creation of a binding legal contract between the Town and UNC governing some period and extent of development on the Horace-William’s Airport tract (Carolina North), I took the firm position that their schedule was too aggressive, the amount of work clearly underestimated. Unlike a traditional development zone, once the agreement is signed the Town – which is us – will be bound not only to the agreement’s stipulations but the supplementary addenda – most notably UNC’s Carolina North Design guidelines [PDF] (which envisaged 8-story buildings lining Martin Luther King Jr./Estes). There are many moving parts to the agreement – each serving a vital function: protecting the environment, maintaining nearby neighborhoods’ integrity, providing a flexible and transparent process to manage UNC’s growth, etc. I argued then, as I do today, that the schedule – which has become even more arbitrary (no money to build) – would severely limit the Council’s and wider public’s ability to review and digest the final agreement. I knew that the bulk of the work would be rushed at the finish line with the public short-changed in the end. Many of the meetings I would start my comments by pointing out that the public was ill-served by the continuing trend of providing key documents late, incomplete or not at all. As recently as last Thursday’s “public” information event (more like window dressing) the revised development agreement was not available until nearly 6pm (for a 7pm session!). The information session reviewed a version of the agreement, completely reorganized and extended, with folks who had no opportunity to have read it (I had my laptop and was scrambling to both read the new revision and find out if my prepared questions had any relevance anymore). Worse, I had to guess on where to find the correct revision (it is here [PDF], not available as a markup or clean version as noted on Monday’s agenda here) [I notified staff later that evening – the problem still exists as of 4:30pm Sunday]. How can Council hold a public hearing on a development agreement that is unavailable to the public 24 hours prior? They can’t but they will. Unfortunately, with key underlying studies delivered nearly a year late, with the development agreement still in flux, informal public input not only not fully integrated but cut-off, my prediction of a rush to failure was all to correct. Council is poised to adopt an agreement incorporating hundreds of pages of supplementary material that they and the Town Manager have not fully read (watch June 8th’s Council meeting) , that is not – as of June 15th – finalized and that continues to have several substantial points of contention – including major traffic issues and costs essentially amounting to a yearly fee of up to several hundreds of dollars per homeowner. Worse, the current draft agreement is peppered – just like a lousy credit-card deal – with “to be determineds”. Without a firm contract and the time to adequately review it, the public continues to be ill-served (heck, when you buy a house you get at least 3 business days to back out after signing – and that contract has legal boilerplate that is well-established, one house instead of 3 million square feet of development and an established legal framework to protect your rights). Why Council is insisting on adopting an agreement that is unfinished and unread? Why not limit the term from 5 to 8 years, the scope to 800,000 to 1,000,000 square feet to protect the public’s interest in maintain our quality of life? Why the rush? Please contact Council here and ask them to grant the public fully 60 days to review a complete and finalized agreement. Orange County Voice, another Orange County organization working on the trash transfer site issue along side Preserve Rural Orange, has picked up on the Plan B options I have posted on as recently as last Fall (Trash Talk:Commissioner Gordon “No Plan B”). Bonnie Hauser, Tony Blake, Susan Walser (recent editorial) and other members have done their homework, presented their cases both for cost effectively using existing local transfer services (one of the options I proposed to the Orange County Commissioners starting several years ago) to partnering with UNC on Waste To Energy facilities [OCV research]. Feb. 11th they renewed their call as reported by Mark Schultz in the Chapel Hill News. The report says vendors charge $40 to $50 per ton to dispose of waste using existing facilities. Two vendors run waste transfer facilities in Durham and are willing to take Orange County’s waste on a monthly or yearly basis, the report says. By contrast, the report says Orange County estimates it would cost $47 to $62 per ton to dispose of waste using a new county transfer station. The difference comes in the county’s spending too much to buy property, spending too much to build the facility and locating it in a rural area that lacks water and sewer services, according to Orange County Voice. The Commissioner’s have opted to research (Herald Sun, Jan. 27th, 2009) alternatives to siting and building a new facility in the particularly troublesome proposed Hwy 54 locale. The race is on to see if common sense and a keen eye towards the future will win out over the current course of events. Watching the folks who formed PRO – Preserve Rural Orange – in response to UNC’s foray into airport building and Orange County’s crazy siting of the trash transfer station on Hwy. 54 has been encouraging. From a small group of concerned citizens, they have developed an activist organization that puts the “pro” in PRO. These are long term issues but, so far, they’ve done a great job rallying other concerned folks from across the county to address these significant issues. Here’s Laura Streitfeld’s report on yesterday’s visit to Greensboro’s waste transfer facility. Station, click on the link below: WCHL report. Yesterday morning I visited the City of Greensboro’s Waste Transfer Station, on a trip planned for new Orange County Commissioners. I rode in a van from Hillsborough with commissioners Pam Hemminger, Bernadette Pelissier and Steve Yuhasz, Orange County’s Solid Waste Director Gayle Wilson and Solid Waste Planner Blair Pollock, and reporters from the News and Observer, WCHL 1360 AM, and a student reporter and camera person from UNC. When we arrived at the station we were joined by Bonnie Hauser and Susan Walser of Orange County Voice and Forrest Covington, who is working on a video project with Bonnie Hauser. While at the site I took photos and video, and attached are two photos, one of a truck dumping trash inside the building and the other of trailers parked outside, with petroleum tanks in the background. Steve Yuhasz speaks with Jeri Covington in the second photo. City of Greensboro Environmental Services Director Jeri Covington talked with us and answered questions about the city’s landfill and waste management history and the transfer station’s financing, construction and operations, then took us for a tour inside on the floor, where operations were slowed down for us to walk around. Like the proposed Orange County station, the two-story Greensboro station is entirely enclosed. Inside there was a thick dust in the air that clouded some of my photos, stirred up by the wind blowing in and by the constant motion of trucks and earthmoving equipment driving in and out, dumping and pushing trash across the floor. The smell was not as strong as I anticipated, but walking through the dusty interior I did get a vivid picture of how traffic, noise and airborne particles from an entire county’s waste would affect the ecosystem and watershed in southwest Orange County. In selecting a site, Jeri Covington noted that they looked for property close to the interstate and near rail lines in an industrial zone. As we saw on our drive in, the station is close to an I-40 exit and and surrounded in all directions by petroleum tanks which Covington called “tank fields.” When it was built in 2005, the Greensboro facility’s cost of construction was $9 million, and the cost of the ten acre property, which Covington said was too small, was over $800,000. She described the station’s funding as a “hybrid,” explaining that they receive funds from city taxes and from tipping fees for taking trash from outside municipalities and companies. 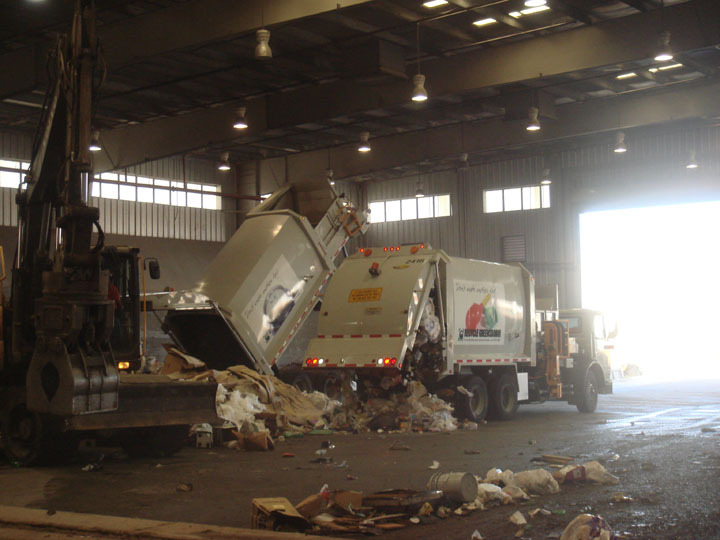 At the Greensboro station, garbage is dropped from the upper floor into tractor-trailers below and hauled to the Uwharrie Regional Landfill in Mt. Gilead, North Carolina. The visit and the van ride were both informative. On the way to Greensboro I spoke with Pam Hemminger, and learned about her background, school board experience and new role as a commissioner. Riding back, Gayle Wilson and Blair Pollock shared their expertise on a broad array of waste management and recycling issues, answering Steve Yuhasz’s and my questions. Wilson discussed the future of the county’s collection centers on Bradshaw Quarry Road and Ferguson Road, one or both of which could close if a collection center were built on the Howell property near the proposed transfer station.